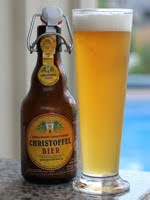 "Christoffel Blond is a bottom fermented golden-coloured beer with a full body, a very balanced taste and a beautiful bitterness due to a generous addition of fresh hop during the brewing-process. The aroma is fruity and has a fresh taste with a pleasant, hoppy finish." Poured from a swing top bottle, this pilsner is a golden yellow. Almost strawlike in appearance, it is hazey in its unfiltered glory. One and a half fingers of bright white head with carbonation streaming off the glass. Some grain on the nose with slight floral and white fruit notes. Some hop grassiness and tangerine also present. Big flavour for a pilsner. Some cereal grains up front with the fruit flavours to the finish. Very smooth mouthfeel. Nothing too heavy. Not overly carbonate. Pleasant. A very tastey pilsner for sure. With it being double hopped, I found my self taking extra care not to compare it to an IPA. It had big flavour for the style and was very refreshing. I would buy it again for sure. I would give an A- .